Corresponding author: Author to whom correspondence should be addressed: Ann E. Elsner, Schepens Eye Research Institute, 20 Staniford Street, Boston, Massachusetts 02114. We measured changes to cone photoreceptors in patients with early age-related macular degeneration. The data of 53 patients were compared with normative data for color matching measurements of long- and middle-wavelength-sensitive cones in the central macula. A four-parameter model quantified cone photopigment optical density and kinetics. 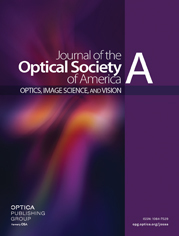 Cone photopigment optical density was on average less for the patients than for normal subjects and was uncorrelated with visual acuity. More light was needed to reduce the photopigment density by 50% in the steady state for patients. These results imply that cone photopigment optical density is reduced by factors other than slowed kinetics. Several Types of Potential Changes of Aging and Disease to Cone Photoreceptor/Retinal Pigment Epithelial Complex and the Result on Color Matching.